To those who have long voiced out their opposition to TRAIN, no statement could be more ironic. 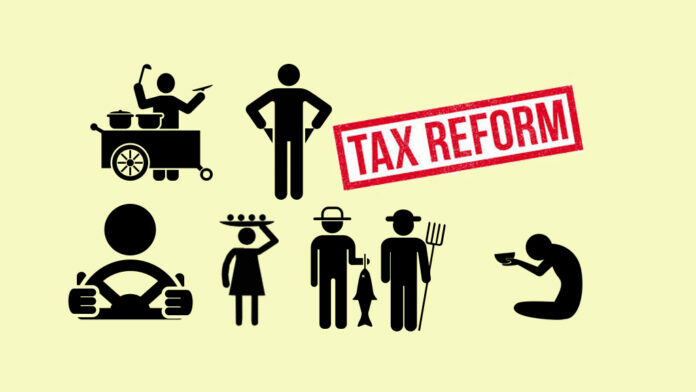 Independent thinktank IBON Foundation said that even with the reported 7.5 million personal income taxpayers that would be relieved from the tax burden, 15.2 million families would be left without any tax income gains. “The overwhelming majority of Filipinos do not get any income tax benefits from TRAIN. Most of the countries 22.7 million families that do not pay income taxes because they are just minimum wage earners or otherwise in informal work with low and erratic incomes,” explained IBON Foundation. Those who will not gain from the lower personal income tax are the informal workers, minimum wage earners and contractual workers, farmers and fishermen and basically families in poverty. Sonny Africa of IBON Foundation said that the cash transfers government would dole out in relation to TRAIN is an admission that this law would spell the worse for the poor. At least 10 million families are set to receive cash transfers from the government, a much bigger number than 7.5 million individuals who would benefit from the lower personal income tax. “We have provided for mitigation, realizing that the poorest of the poor would need some kind of assistance as a result of TRAIN,” Presidential Spokesperson Harry Roque explained. TRAIN allocates funds for “unconditional” cash transfers to the poorest 10 million families regardless of family size – P200 ($3.98) monthly in 2018, P300 ($5.97) monthly in 2019, and P300 monthly in 2019. The original TRAIN proposal from the Department of Finance carried with it the idea that the cash transfers would be available for only three years, a period when the poor would have adjusted to the new higher prices. But this stop-gap measure still ignores non-gainers that would not be receiving the small amount of cash transfers. Minimum wage earners, long exempted from personal income tax, are not among those who would gain from the lower personal income tax. The current daily minimum wage in the National Capital Region, the highest in the country, stands at P475 ($.9.45) to P512 ($10.18). The lowest is in Ilocos Region at P243 to P280. Wages in the the Philippines are among the lowest in the whole Association of South East Asian Nations (ASEAN), pushing more people in the country to poverty, but businesses and investors view this as ‘competitive’ as they would want to invest because of the lower labor costs. Contractual workers, those whose contracts end before six months and usually paid lower than the minimum wage, were also among those who will not gain from the lower income tax in the TRAIN but shoulder higher prices of goods and services. IBON Foundation also noted that the data of 7.5 million who would no longer pay taxes that the government kept on mentioning appeared to have included minimum wage earners who have long been exempted from paying personal income tax because of another law. In the Philippine Statistics Authority’s Family Income and Expenditures Survey conducted in July 2015, more than 26 million Filipinos remain poor, and a little more than half of it in extreme poverty or lacking the means to feed themselves. The Asian Development Bank noted that 21.6% of Filipinos live below the poverty line in 2015, the third biggest incidence of poverty in a country in the South East Asian region. According to the PSA, the national poverty threshold stood at P10,969 per month, while the national food threshold is at P7,638 per month in the 2015 survey. The poverty threshold, also known as the poverty line, is the minimum income required to meet basic food needs and other non-food requirements such as clothing, housing, transportation, health, and education expenses. The food threshold, the minimum income required to meet basic foods needs and satisfy nutritional requirements set by the Food Nutrition and Research Institute (FNRI), comprises around 70% of the poverty threshold. This poverty and food threshold, however, has been criticized for being too low, and giving the perception of those living with income above or just above it as not poor. According to 2015 government figures, a poor Filipino is one who has at most P50.92 ($1.01) per day for food or P73 ($1.45)per day for food and non-food items. A kilo of government rice stands at P35 while a can of sardines, poor’s staple meal, stands at P20—but that viand is enough for only one to two persons for one meal and the rice for five to six persons for one meal. IBON Foundation estimated that a family of six needs P1,086 ($70) a day or P32,580 ($2,100) a month to live decently. With such estimates, this would put more than 60 million Filipinos or a majority of the population below poverty line. The gains would only be felt by fixed income earners, albeit a bit short-lived. Fixed income earners such as business process outsourcing (BPO) workers or call center agents and government employees or professionals at the beginning of their careers such as nurses and teachers would soon lose the exemption as their salaries rise until after three years when the tax income schedule would be revisited or updated. The Salary Standardization Law provides the regular increase of government employees’ salaries, but was failed to be updated by Congress before former president Benigno Aquino III left office. Aquino instead issued an Executive Order 201 to increase government employees salaries, including the next president’s salary from P120,000 to as much as P388,096 in the fourth tranche. With the retroactive implementation of EO 201 on January 1, 2016, those in Salary grade 11 step 4 in 2018 would no longer be exempted from personal income tax. Teacher 1 in 2018 in salary grade 11 would receive P20,179 and P20,754 in 2019, barely missing the P20,833 monthly salary exempted in the lower income tax in TRAIN. IBON Foundation added that the burden on the poor can only get worse once it becomes clear what VAT exemptions will be removed. Many items with value-added tax (VAT) exemptions were also removed, as per the context of the original proposal from the DOF to do away with so many exemptions. Of around 90 items (products and services) exempted from VAT, only a few items were specified to have retained their exemptions. Among these retained VAT exemptions included those for senior citizens and persons with disabilities, raw food and agricultural products, business process outsourcing (BPO) firms, cooperatives and prescription drugs and medicines. The bill Congress ratified should specify all laws that would be repealed given the change in VAT exemptions, however this procedure was not followed. This opens to uncertainty items that have VAT exemptions in other laws, but were not specified in the TRAIN to have retained their exemption, such as the exemption for state universities and colleges and socialized housing among others.